The locally listed building is owned by Bournemouth Borough Council and run by social enterprise, BH Live. They were working together to improve facilities with a sympathetic respect to its past, while at the same time ensuring the centre benefits from the most up-to-date energy saving products on the market. With a responsible strategy like this firmly in place, BH Live is no longer incurring higher than necessary utility costs, making savings which can be ploughed back into the running of the centre for the good of its members and the local community. With a colourful history in public service spanning 87 years, Stokewood was once home to a dance hall and slipper baths. Today, it is a busy public leisure centre providing the community with a wide range of health and wellbeing facilities. Lighting is as important in terms of energy saving and reducing a building’s environmental impact, as it is in creating the most comfortable experience for its visitors. Kevin Ladner, BH Live’s Head of Facilities Management: “Existing lighting had reached the end of its useful life, and was costing more and more to upkeep. Not only that, the cost of reaching lighting in an area with a high ceiling over a pool also had to be factored in”. BH Live and the Council were already working with local LED lighting design, manufacture and installation company Led-Zip Lighting at Bournemouth International Centre (BIC). Based locally in Northbourne, Dorset they were invited to quote for the Stokewood project. Even though the existing lighting has been in situ for many years, we were still able to replace them with a modern, low energy LED alternative. 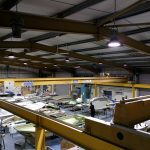 As well as specifying and sourcing the correct LED fitting, we provided a flexible service and carried out the installation sensitive to the running of the centre. Installation, therefore, took place during the night when the centre was not in operation. The next lighting project planned by Led-Zip Lighting at Stokewood is a daylight monitoring function, which will enable the automatic dimming of the LED lights as natural daylight levels fluctuate throughout the day. This will reap further, important energy savings for the centre.